Since I finished the Lotus Flower Tile Fragment, I haven’t had a piece for the Dreams of Amarna to work on. I’ve been thinking about several, of course, but in combination with the Online University projects I’m working on and my sudden idea for the Vision Of Placidus, none of them really caught fire. Then I filled very dull, dreary afternoon – pouring with rain, with no light to embroider by (remind me, it’s summer here in the northern hemisphere, right?) – with the preparations for working the solo version of the Hittite Amulet. 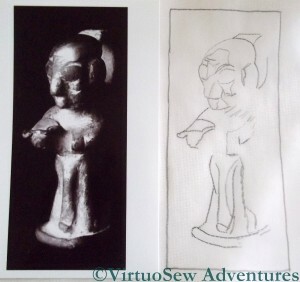 He’s going to be worked in or nué – actually argent nué, since I’ll be using a silver thread! – so the first thing to do was prepare the base fabric. There were two photos from the EES to choose from, one of them rather moody, with the amulet seeming to look out from the black background, and the other, arguably better lit, and full face rather than three-quarter. Guess which I chose? Yes, of course, the moody, dramatic one! It’s very hard to trace a picture that doesn’t show everything you know is there. You will see that the lines I’ve traced produce a sketchy effect, not complete detail. That’s because I decided to paint more of the details onto the background fabric to help guide my needle, and the lines were really only there to guide my brush! It may seem that creating this painted panel is a lot of work that will be completely hidden, but while my other or nué panel, Christus Natus Est, had simple sweeping lines, and the coloured background was merely there to prevent cream calico from grinning through any gaps, the Hittite Amulet is a very much more intricate design. Creating my painted version putting darks and lights in the right places took immense concentration and I would hate to have to concentrate that hard on the design when the execution is going to be so challenging. Good luck! I like the moody look. While I wish you luck – I know with your skills and stitchery perfection I doubt if you’ll need my wish!! Can’t wait to see this. I kicked myself after I had finished up the first three black and ecru birds that I hadn’t painted the black sections of the birds before punching as I had to go back in afterward and fill in all the microscopic background fabric which showed through. I learned my lesson! I look forward to seeing this one grow. I’m looking forward to seeing the progress on this one – as I have absolutely no idea what most of what you said means!! Good luck. But looking at that amulet I think it will decide what happens in your embroidery. I’m very impressed with your painted version, but like ‘frayed at the edge’, I’m having trouble visualising what you mean, and indeed visualising it in argent nué. I have no doubt, though, that the finished product will be a coup, so looking forward to seeing it develop. Hope you’re enjoying the sunshine. I wish you luck but doubt you will need it. I loved observing your last or nue piece in progress….